Saudi Aramco’s downstream strategy seeks to enhance the value of its resource base by targeting increased horizontal and vertical integration across the hydrocarbon value chain. The successful execution of its strategy would deliver a world leading, strategically integrated downstream network – one that maximises the worth of the hydrocarbon molecules Saudi Aramco produces – and a robust portfolio that is more resilient to market turbulence. • Maximise value creation from power and cogeneration integration opportunities. 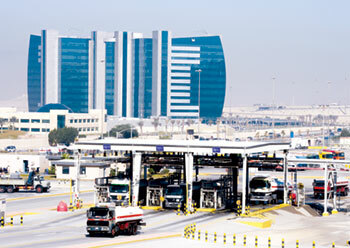 Aramco’s downstream business is one of the company’s engines for growth and diversification. Saudi Aramco started building its first pipelines and shipping facilities in 1938, loaded the first tanker to ship Saudi Arabian crude oil in 1939, and commenced refining operations at its original Ras Tanura refinery in 1941. Since then, Saudi Aramco has built an extensive global downstream network that is designed to provide a diversified portfolio of non-crude oil revenue streams, create resilience in times of crude oil price volatility, secure dedicated outlets for its crude oil in strategic growth markets, and allow it to maximise value across the entire supply chain – from the wellhead to customers. In Saudi Arabia, Aramco’s downstream operations encompass wholly owned and joint venture refineries and chemicals plants, and a kingdom-wide distribution network. The close integration of its upstream operations with its downstream system enables Aramco to respond safely, reliably, and efficiently to meet the needs of its growing domestic and international customer base. Aramco’s global downstream network supplies a diverse and expanding range of products. Saudi Aramco is a major refiner and among the global leaders in base oils. Chemicals is the fastest growing demand sector for crude oil, and its ventures in this sector position Aramco for future growth and long-term value creation. Saudi Aramco also seeks innovative new routes to value. For example, its proprietary CONVERGE technology transforms emissions by using captured CO2 to make an array of high performance polyols with a broad range of applications. In-kingdom downstream: In Saudi Arabia, Saudi Aramco manages a downstream network that encompasses gas fractionation, refining, distribution, and power generation that efficiently supports its operations. 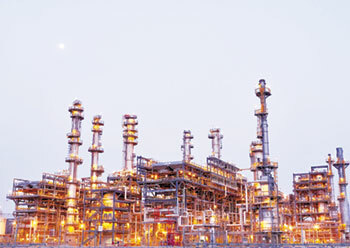 Within this system are the Sadara chemicals joint venture and PetroRabigh (an integrated refining and chemicals company), eight refineries (three wholly owned), 23 bulk plants, two international airport refueling sites, more than 21,000 km of pipelines, and 20 export berths at six marine ports, including the Port of Ras Tanura – the world’s largest group of crude oil export terminals. Saudi Aramco partners with world leading refining and chemicals companies in Saudi Arabia to produce a slate of products for fractionation plants. The MGS collects all associated and nonassociated gas produced in the kingdom and connects key gas production sites with demand centres in the kingdom. In support of its strategy to optimise supply and distribution of petroleum products in the Western region, Aramco began a project to convert the industrial complex that includes its wholly owned Jiddah Refinery into a petroleum products distribution centre, without refining operations. The conversion project also seeks to enhance safety and environmental performance. And the loss of the relatively low refining capacity of the 50-year-old Jiddah Refinery – 77,000 bpd –will be more than offset by Aramco’s Yasref and Satorp (Saudi Aramco Total Refining and Petrochemical Co.) joint ventures in Yanbu and Jubail, respectively, and by the start-up of its Jazan Refinery. Aramco’s chemicals operations span the sector from the production of basic chemicals such as aromatics, olefins, and polyolefins, to more complex products, including polyols, elastomers, and advanced synthetic rubber. In Saudi Arabia, Aramco’s operations supply all of the feedstock required by its chemicals facilities and all of its domestic chemicals joint ventures. Most of Aramco’s international joint ventures are integrated with refineries, providing production flexibility, and opportunities for cost competitiveness. The company’s aspiration is to become a top-tier, globally integrated chemicals business. Aramco is pursuing three routes to fulfil this aspiration: Leveraging existing assets, developing a global business platform, and seeking selective organic and inorganic growth. In 2017, Aramco began work to launch a wholly owned subsidiary, Aramco Chemicals Company, to consolidate and manage the marketing of certain chemical products. Its chemicals expansion strategy is supported by its expectation that the petrochemicals industry will be the fastest growing sector for crude oil, accounting for 15 per cent of all crude oil demand by 2040. By increasing its participation in this market, Aramco seeks to create greater long-term value from its resource base and enhance its resilience to oil market fluctuations. Completing chemicals megaprojects: Sadara and PetroRabigh Sadara, Aramco’s joint venture with The Dow Chemical Co. in Jubail Industrial City, began full operation of the last of its 26 plants during the year. The facility achieved reliable operations at full design feed capacity of 85 mmscfd of ethane and 53,000 bpd of naphtha. At Aramco’s PetroRabigh venture with Sumitomo Chemical on the Red Sea Coast, it achieved mechanical completion of the Rabigh Phase II project, which includes a new aromatics complex, an expanded cracking facility, and differentiated polymer units. Commissioning and start-up of all units are expected in 2018. Aramco’s investments in power, which primarily support its upstream and downstream operations, seek to achieve economies of scale by considering adjacent demand centers and capturing opportunities for advantaged fuels. In addition, Aramco’s strategy is to identify opportunistic growth in the domestic power market. Aramco continued to transform its power business from dependency on third parties to self-sufficiency in electricity and cogenerated steam, while maintaining a steadfast concentration on safety, reliability, and energy efficiency. In 2017, it maintained self-sufficiency in power generation, with excess power exported to the national grid under a commercial agreement. Company power efficiency reached 67 per cent by yearend, an improvement of 1 per cent over the previous year. In 2017, Aramco created Aramco Power. Its establishment advances the transformation of the company’s power business to a sustainable commercial business through the generation of service and trading revenues. The joint venture power cogeneration facilities at its Hawiyah Gas Plant, Abqaiq Plants, and Ras Tanura Refinery were operational in 2017. In addition, the construction progress on the cogeneration facility integrated with Aramco’s Fadhili Gas Plant reached 51 per cent at year-end. Global downstream: Expanding integration Worldwide, Aramco participates in refining and marketing ventures in China, Japan, and South Korea, and is the sole owner of the Motiva refining and marketing company in the United States. Aramco also participates in a joint venture speciality chemicals company, Arlanxeo, headquartered in the Netherlands. In 2017, Aramco continued to evaluate and pursue opportunities to increase its refining and chemicals capacities in key strategic markets. Aramco also explored opportunities to integrate chemicals manufacturing with potential joint venture refineries, and to develop or expand chemicals production facilities at existing joint ventures. In Malaysia, it executed Share Purchase Agreements with Petronas to participate in a grassroots full conversion refinery and integrated chemical cracker to be located in Johor Bahru, Malaysia. The project, known as Rapid (Refinery and Petrochemical Integrated Development), includes a 300,000 bpd refinery, 3 million tonnes per annum of olefins capacity, and downstream chemicals manufacturing units. Situated adjacent to Singapore, the refined trading products hub for Asia, the venture is planned to increase placement of Aramco’s crude oil in the region, and add to its refining and chemicals manufacturing, and marketing capacity in strategic markets. In China, Aramco signed a Memorandum of Understanding with China North Industries Group Corp (Norinco) to participate in its planned refinery expansion and a 300,000 bpd greenfield refinery in Panjin in Liaoning Province. Also in China, the company marked the 10-year anniversary of our Fujian Refining and Petrochemical Company joint venture. 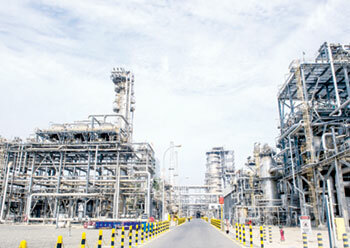 Over the past decade, with its partners the Fujian Provincial government, Sinopec, and ExxonMobil, Aramco has tripled the facility’s crude oil production capacity, increased the capacity of its ethylene cracker, and added a new ethylene oxide/ethylene glycol unit. In Indonesia, following the joint venture development agreement signed with Pertamina in 2016, Aramco completed basic engineering for the upgrade and expansion of the Cilacap Refinery in Central Java. 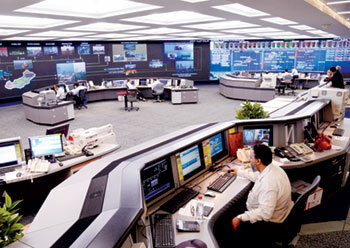 In New Delhi, India, Aramco opened a new office for its Aramco Asia-India affiliate. The office will strengthen its presence in the country and potentially enable broader opportunities between Saudi Aramco and leading Indian entities. In the United States, the dissolution of the 18-year-long Motiva joint venture was finalised during the first half of the year. Saudi Aramco retained the Motiva name and assumed sole ownership of North America’s largest single-site crude oil refinery, located in Port Arthur, Texas. In addition, Saudi Aramco retained 24 terminals and an exclusive license to sell fuel under the Shell brand in Texas and much of the US Midwest and Southeast. In the Netherlands, Arlanxeo is Aramco’s speciality chemicals joint venture that produces, markets, and distributes synthetic rubber and elastomers. In 2017, Aramco began design of a project to utilise crude C4 from Sadara to produce butadiene and related coproducts such as MTBE and high purity isobutylene as feedstock for Arlanxeo for a planned elastomers plant to be located in Saudi Arabia. In its drive to grow its base oils business, in 2017 Aramco marked a number of milestones, including establishing a global interchangeable slate of Saudi Aramco branded base oils among our Luberef, S-Oil, and Motiva affiliates, and launching the brand at three major base oil and lubricants conferences. Aramco also commenced domestic sales of aramcoDURA and aramcoPRIMA base oils. With the completion of the Luberef expansion project in Yanbu, Aramco is aiming to become a leading supplier of global base oils, with gross production capacity of 4.7 million tonnes per year. Saudi Aramco Products Trading Company (ATC) is Aramco’s wholly owned subsidiary based in Dhahran, with a branch in Singapore. ATC is Saudi Aramco’s trading arm and conducts trading activities in refined products, liquid chemicals, and polymers. ATC is also involved in chartering activities to deliver products to clients, and is the largest charterer in the Middle East region. In 2017, ATC continued to expand its market presence by entering new markets. • Oil and gas network integrity: Advanced sensing, prediction, and monitoring technologies. Improving efficiency and performance: Oil and gas treatment Technologies to upgrade and enhance oil and gas treatment show potential to improve production performance, increase the value of lower quality gas, and save water. The use of membrane-based technology potentially offers a cost-effective approach to upgrade low Btu gas for use in cogeneration electrical power plants, helping minimise the use of liquids for power generation. In 2017, progress was made on the removal of acid gases through specialised membranes. Aramco also completed a study that confirmed the capability of membranes to recover high levels of helium with a high enrichment factor, which could become a potential commercial opportunity. Aramco is investigating the feasibility of upgrading heavy oil for refining, petrochemical, and power generation applications. This research programme could result in more flexibility in processing heavy crude oil grades and residue fractions of crude oil to create greater value. One focus area is its proprietary supercritical fluid technology for upgrading low value refining streams to distillates and chemicals. In addition, a number of evaluations were completed in 2017, including a process economy evaluation for lube oil and low-sulphur marine fuel oil. Commercially available refining catalysts are designed for generic feedstock, and conversion processes can negatively impact product yields and quality. Aramco is conducting research into specific catalyst formulations and processes to enhance the performance of our refining conversion processes such as hydrocracking, fluid catalytic cracking, and hydrotreating. Key objectives of the research include increasing product yields and producing high quality feedstocks for production of propylene or base oils from heavier feedstocks. In 2017, Aramco developed 15 new catalysts based on zeolite minerals, and completed pilot plant testing of 16 catalyst systems. Transforming the resource base: The conversion of advantaged liquid feedstock to chemical building blocks and the enhancement of lower value streams from refinery and petrochemical sources have the potential to create greater value from its resource base and strengthen its diversification and resilience as a business. With its partner Sumitomo Chemical of Japan, Aramco increased the throughput of its PetroRabigh 1-Butene plant through the development of a novel anti-fouling additive technology (AFA). Aramco’s CAN-FCC catalyst offers a high tolerance for heavy oil streams in fluid catalytic cracking processes and increases the yield of various distillates and chemicals. In 2017, Aramco demonstrated an additional propylene yield improvement with this catalyst over the existing catalyst used in one of its joint venture refineries. Aramco’s SuperButol technology targets the conversion of mixed low-value butenes streams for use as a gasoline blending component to improve fuel combustion and increase octane. In 2017, the technology was successfully scaled up and demonstrated, and the basic engineering package study was completed for potential commercial deployment. The safe and reliable delivery of Aramco’s products to customers is paramount. With an emphasis on corrosion and materials, Aramco’s R&D efforts seek to protect and enhance the integrity and performance of its oil and gas network. Aramco’s goals are to significantly reduce the annual cost of inspection and monitoring, and ultimately the cost of corrosion, through the use of autonomous robots and advanced sensing and prediction capabilities. To achieve its goals, Aramco is developing cost-effective robotic sensing and inspection tools to monitor shallow water and onshore pipelines. Additionally, it developed and released a storage tank calibration robot, improving inspection quality and reducing calibration time from 16 hours to four hours. To create additional value and enable greater opportunities for domestic businesses, a number of these technologies are being commercialised for local, regional, and global deployment.